I've been working on integrating shopping carts and marketing platforms for what feels like a very long time. Maybe it was all the late, late nights when we were building the first version of our legacy app Revenue Conduit ... but the reality is, it's only been 6 years! However, what was an application born out of scarcity and necessity has now become an integral part to how many merchants operate. In that time others have entered the space with their own versions of shopping cart integrations. One of these providers is our friend and partner HubSpot. 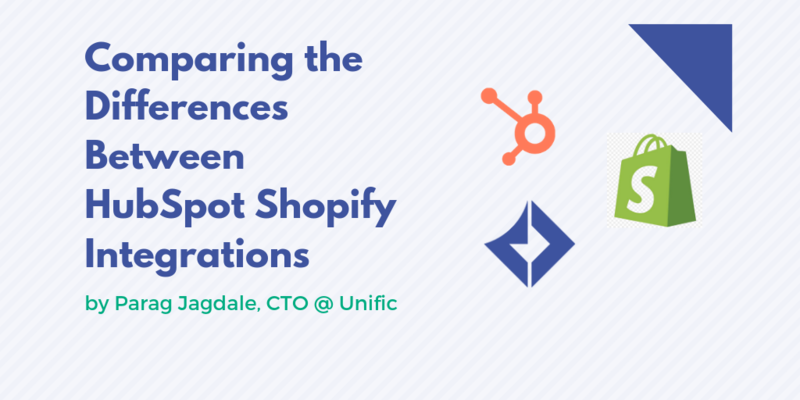 Their native integration with Shopify is a very positive development for Unific and the HubSpot ecosystem. In fact, our growth has actually accelerated since the announcement of their Ecommerce Bridge APIs and the native integration. The saying "a rising tide lifts all ships" seems to be applicable here. One reason for this is because we were able rebuild our Unific integrations on top of the new HubSpot Ecommerce Bridge API to incorporate the native features while providing a more reliable, faster, and deeper offering. Because of this, Unific's Shopify, Magento 2 and WooCommerce to HubSpot integrations are more robust than ever. Now saying all of that, be aware that we are 100% committed to the HubSpot ecosystem and we’re actively working with them to make great ecommerce tools to help all HubSpot customers that need them. Everyday we support many HubSpot customers with ecommerce specific expertise and services. It's a great platform, a great partnership and I think we all agree that the tide is rising! Dynamic Coupon Code Generation YES NO With Unific, you can automatically generate single-use coupon codes with expiration dates, and various discount types like free shipping. You also have the ability to create product specific coupon codes. Cart Abandonment Marketing YES LIMITED Branching logic in abandoned cart workflows is not available in the native integration. The native integration provides a very simple abandoned cart recovery workflow. Product Personalization YES NO Product related personalization in emails (product URL, product image URL, product name, and product price) is only available with Unific. These merge fields allow you to personalize emails. Advanced Workflow Segmentation YES NO Any “Last Order” based segmentation and targeting is only available in Unific. The native integration is not able to distinguish between products and categories bought in the last order versus products and categories bought in any previous order. Segmented Order Confirmations YES NO With the rebuild of Unific, you will have the ability to send out segmented order confirmations! For example order confirmation for first-time buyers, or for customers that bought a particular item, and more. Deal Record Integration YES YES Both integrations sync orders to deal records. Compatible with HubSpot > Salesforce Integration YES NO The native Shopify integration cannot be used if the HubSpot Salesforce integration is connected.